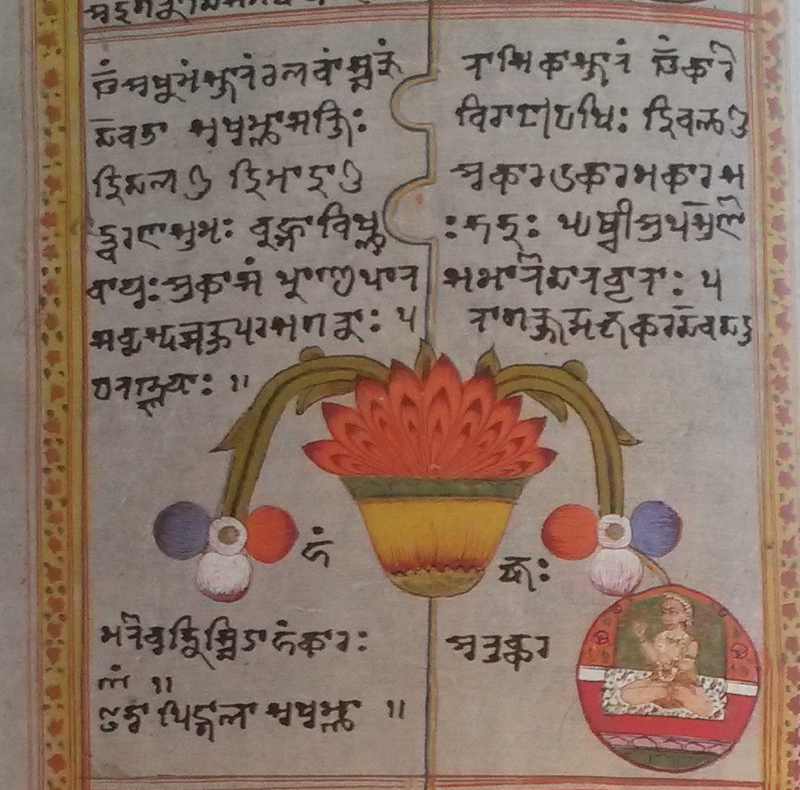 The ‘Universal Mother’ Chakra Scroll is equivalent to the ‘Chakra Scroll’ now on Display in San Francisco. 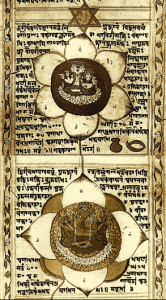 Shortly after my online course with Shiva Rea on the Chakra Scroll of the ‘Universal Mother’ (left) began in March of 2013, a remarkable event occurred. A week later, photos were sent to me of a nearly identical (and equally rare) Kashmiri scroll (right) from the Victoria and Albert Museum in London, on loan to the Smithsonian Museum,for its ‘Yoga Exhibit’ currently at the Asian Art Museum in San Francisco. 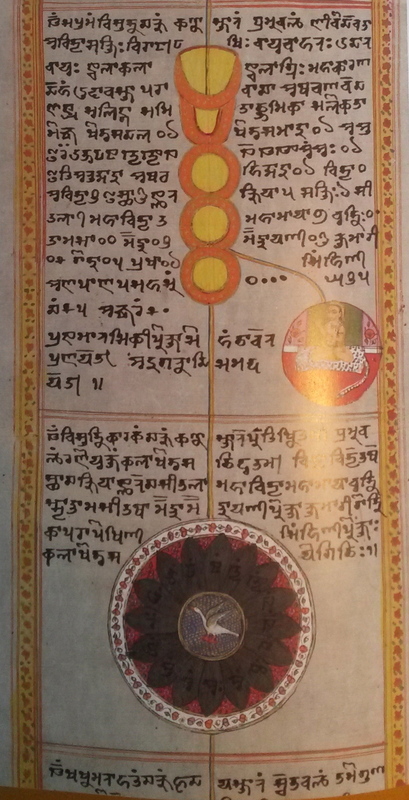 I soon discovered that its chakras and corresponding text are nearly identical to our ‘Universal Mother’ Chakra scroll (see below). 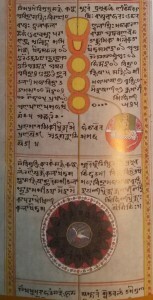 * Both scrolls reveal almost an identical system of 11/12 chakras (see below). indicating that both draw from the same source. 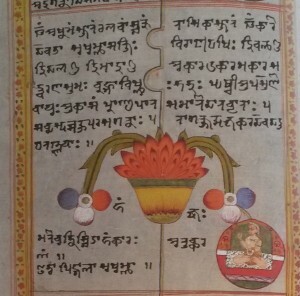 * Both scrolls were composed by Kashmir paṇḍits (see below) in the Sanskrit script known as śāradā, unique to Kashmir (most of the Paṇḍit Community has been in exile from their homeland since 1990). * By comparing and critically editing the two scrolls together, I will be able to offer the best translation possible. Sample comparisons: Chakra #12, the ‘Domain of the Bee’. “This is the twelfth location, the ‘Domain of the Bee’. Its color resembles the golden hue of a million suns. 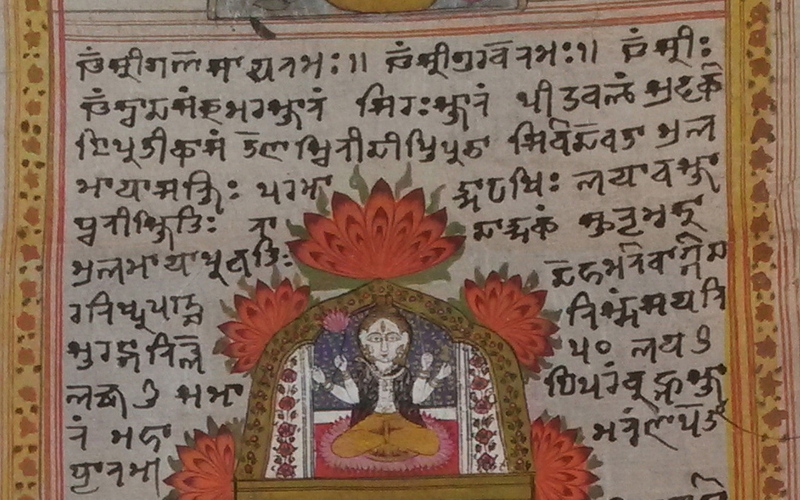 The divinity is Śiva. 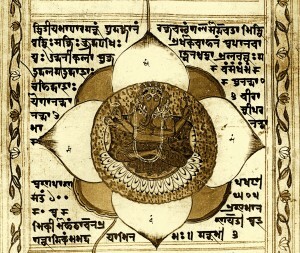 The presiding sage is the universal soul (paramātma-ṛṣi). 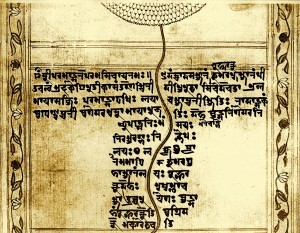 Śakti at this domain is the sound of resonance (nāda), dissipated upon its arising to the ‘place of dissolution’ (at the crown of the head). Here, she is called ‘Source of Embodied Delusion. The [presiding] Power is the Root Cause of Māyā, the embodiment of the heat [of a million suns] who shines with [their collective] light. She is the sound located at the place of dissolution. She consists of resonance, the sound of which presides at the place of dissolution. 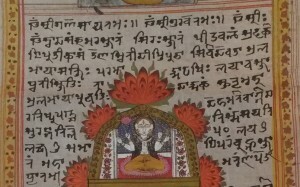 She is Elemental (Embodied) Māyā, the un-broken voice of whom is imperceptible….’ (click here to see entire translation). 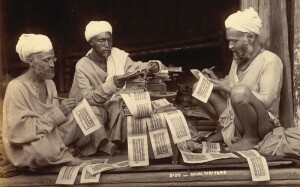 Both scrolls re-surfaced in private British hands, and were probably taken from Kashmir during Britain’s occupation. They represent an exquisite yet endangered part of Kashmir’s literary, spiritual, and artistic legacy and should be accessible to the Kashmir Paṇḍit Community and to anyone interested in the study of this incredible chakra system, a far more complete revelation of the chakras known known to the west (representing 6 of the 12 chakras presented in both scrolls – mūlādhāra -> ājñā), along with yoga practices applied to them that have been lost to the West.